Idaho’s rivers access some of the most pristine terrain in all the state. They are home to abundant flora and fauna, an impressive network of hiking trails, and some of the country’s best whitewater. Of all the rivers that flow through Idaho, perhaps the most spectacular is the Middle Fork of the Wild and Scenic Salmon River. Often overlooked, the Middle Fork offers some of the best cutthroat fishing in Idaho. The population of this unique strain of west slope cutthroat was almost destroyed by the end of the 1960s. A catch-and-release regulation was then imposed, and that, along with the very limited access to the river and little angling pressure, has resulted in a river loaded with fish. Twelve- to fourteen-inchers are common, with an occasional sixteen- to eighteen-inch fish. Native rainbow, mountain whitefish, and bull trout are also caught here. There will be an orientation meeting at 8:00 PM at The Stagecoach Inn. Your trip leader will meet with you to answer last-minute questions and distribute waterproof bags in which to pack your personal gear, and confirm the meeting time for the following morning. Early this morning we depart Salmon for the airport and our flight to the Thomas Creek airstrip. You’ll be greeted at the river by your guides and given a brief safety talk. Fishing opportunities today range from streamside casting in the pristine waters of the side creeks, fishing from the boats as you travel down the main river corridor, and finishing the day with waders at camp. And if that’s not enough, we may stop at Hospital Bar hot springs for a soak and then run several Class II and all four Class III Tappan Rapids! The fishing just keeps getting better. We stop to see the ancient pictographs and fish the deep pools above Aparejo Point. We may anchor and fish the glassy smooth water above the Flying B Ranch or stop at Warm Springs Creek for a short hike to another hot soak. Don’t forget to hold on—Haystack and Jack Creek are some of the rapids we’ll encounter. Unbelievable is how most people will describe this day. We encounter breathtaking scenery, great fishing opportunities, and a flurry of Class III-III+ rapids. We may stop to hike and fish Big Creek, or continue float fishing down Impassable Canyon, with its steep granite walls and deep pools. It’s a great day to get acquainted with one of Idaho’s protected bull trout. The wet rides aren’t over yet. Rapids like Rubber, Hancock, and Devil’s Tooth are sure to put a drop or two of water in the boat. From here on out, the river is characterized by smooth, deep pools providing cover for big fish. We join the Main Salmon for the final 4 miles to Cache Bar, the take-out for most Middle Fork trips. The day before your trip we will meet at 8:00 PM at The Stagecoach Inn in Salmon, Idaho for a pre-trip meeting. Your trip leader will provide a thorough trip orientation and pass out your waterproof bags so you can pack your belongings that evening. The trip leader will also confirm the meeting time for the following morning and give you an opportunity to ask any last-minute questions. Gem Air offers a round-trip air shuttle package to and from Boise for approximately $395*. Boise (BOI) is served by several commercial airlines including United, Delta, Alaska, Southwest, Allegiant, and US Airways. Please note: When booking your flights, be sure you arrive in Salmon the day before your trip starts. You will need to arrive in Boise no later than 3:00 PM as the last flight from Boise to Salmon generally departs at 4:30PM. When your trip ends, OARS will provide land transportation back to Salmon, with arrival between 4:00 and 6:00 PM. Plan to spend that night in Salmon. Gem Air will begin return flights to Boise the next morning. For your connecting flight home, we recommend booking your departure from Boise at 11:00 AM or later. To arrange your flights, please contact Gem Air (208) 756-7382 or email flying@gemairflights.com. Please mention you are an OARS guest when making your reservation. 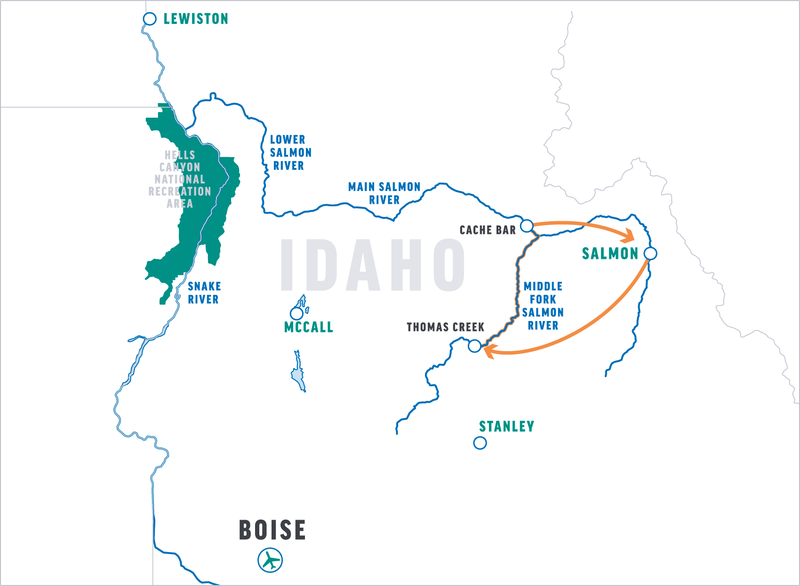 Salmon is 248 miles north of Boise, Idaho, approximately a 5 ½-hour drive. Traveling from Boise, take SR 21, a scenic drive over Lowman Pass to Stanley. Bear left onto SR 75 to Challis, and then take US 93 north to Salmon. If you are planning on renting a car, we recommend you contact Hertz (208) 383-3100. On the final day of your river adventure, you will be returned to The Stagecoach Inn in Salmon. You should arrive back between 4:00 and 6:00 PM. We highly recommend you overnight in Salmon. On our Middle Fork fishing itineraries we bring oar rafts. They provide a sturdy and maneuverable fishing platform, are rowed by one of our experienced fishing guides, and carry two guests. We can use our drift boats when the water gauge located 300 feet above the Middle Fork Lodge bridge reads above 1.5 feet. These smaller low-volume dories are available only when conditions allow. Although the whitewater may be world renowned, fishing on the Middle Fork is also superb. The ease of fishing, combined with unsurpassed wilderness and abundant wildlife make for the trip of a lifetime! The Middle Fork is renowned for its trout fishing. To protect the resource, all fishing is limited to catch and release, with single barbless hooks. No bait is allowed. Our guides will be happy to explain proper handling techniques for catch and release fishing, if you are not already familiar with them. You can also fish for smallmouth bass and, in the fall, steelhead. You’ll need to bring your own gear. We recommend collapsible poles for ease in packing, light spinning tackle with 4- to 6-pound test, and an assortment of spinning lures such as Mepps, Rooster tails, and Super-dupers. Please bring your rod protected in a hard case. Fly fishers do quite well, especially in major tributaries. Non-residents of Idaho can buy a short-term fishing license by calling 1-800-635-7820. You can also purchase one online at www.fishandgame.idaho.gov and https://id.outdoorcentral.us. Additionally, licenses are available in Salmon, you can purchase licenses at Silver Spur Sports, 403 Main Street. Their telephone number is (208) 756-2833, please call for hours. Remember to purchase licenses by the night before your trip puts in, because there is no time to do so in the morning. We provide a limited supply of sodas per person per day, water, lemonade and a limited supply of beer and wine with dinner. You are welcome to bring your own favorite beverages, alcoholic or non-alcoholic, in non-glass containers. If you choose to bring additional drinks or alcoholic beverages, please let us know in advance. For your safety and the safety of others, alcoholic beverages are limited to camp. On our Middle Fork Salmon Fishing trips we bring oar rafts, which provide a sturdy and maneuverable fishing platform, and are rowed by one of our experienced fishing guides. Each oar raft carries two guests. The Middle Fork has lots of hiking opportunities. Each camp offers everything from a short stroll to a long hike. If there is interest, we may be able to fit in guided hikes. There is ample opportunity for the curious to explore the area at length, and on our fishing trips, hiking is most often oriented toward fishing opportunities. Remember however, that all hikes are optional and you can choose to stay at camp and relax or fish the river. You may want to check one week prior to your trip for an up-to-date weather forecast. We recommend the following website: www.wunderground.com for weather in Salmon, Idaho. September Trips: This is surely one of the most beautiful months to be on the Middle Fork of the Salmon River, but September can also produce some surprisingly chilly times. During the fall, the sun is not far enough north in the sky for its warming rays to reach down into the river canyon for as many hours a day as it does in the summer. This means more shady areas, fewer sunny ones. Therefore, when you are splashed (drenched) going through the rapids and you’re in a shady area, you will get very cold unless you are prepared. We will provide wet suits on cold weather trips. At the pre-trip meeting each person will be given two large waterproof bags (approximate sealed size: 13″ diameter x 25″ tall). One bag will be for your clothing and personal items; the other bag will be for your sleeping gear (sleeping bag, sleeping pad, ground tarp, sheet and pillow). These two bags will be your “checked luggage” and will only be accessible in camp. Tents are stowed separately. Please note: your sleeping gear will come already packed in one of the two waterproof bags. We also provide a small waterproof bag for day use where you can keep items such as raingear, camera, sunscreen, lip balm, etc. (approximate sealed size: 17” tall x 9” diameter). The bags are cylindrical in shape and pack from the top. Please pack light, and keep in mind that river attire is casual: comfort, convenience and boat space take precedence over style. At the end of the trip, you will return to Salmon with your waterproof bags, where you will be able to unpack your gear before your trip home.